Here is the video of the dropdeck trailer on demonstration carrying 5 tons of load which is the forklift. Al Ameen Engineering has been producing RafRamps utility trailers for military, government and private companies since 2009. Trailers have increased productivity and output of workers. The RafRamp trailer offers the best combination of productivity, quality and value for your money. The applications are many as it can load equipment at ground level without the need for cumbersome unattached ramps or tilt beds, thus saving you time and money while increasing operator safety during the loading process. 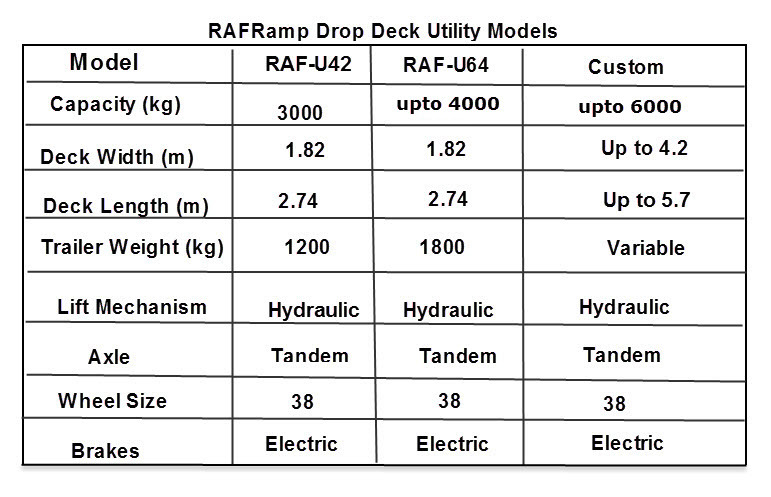 To increase safety and productivity of the Facilities Management, Logistics and Construction sectors, Raframp has made Drop deck system where unlike ramp and tilt-bed systems, the Raframp trailer features a unique hydraulic mechanism used to lower the entire deck of the trailer to ground level. This eliminates the need to drive, pull, winch, or push a payload up or down a loading ramp and provides for faster, safer and more efficient loading of everything from construction and industrial equipment to vending machines and supplies. - No driving or lifting payload. - No cumbersome ramp adjustments. - Can be loaded or unloaded while detached from a tow vehicle. - There is increased safety on drop deck over ramp type as there is a danger of tipping when loading/ unloading heavy materials. - Can accommodate multiple items. Drop Deck Trailer can be used to transport goods easily and safely unlike taking in unsafe 45 degree ramp on recovery or other utility trailers. -anything that fits in the space. Raframp is committed to providing the best service, parts, support and distribution for the trailers. We provide 1 year of support after the sale of trailers. If you are interested in our drop deck trailers that you can load materials without crane or forklift, please click below button to contact us.